Joy Christian wrote: Yes, your input was helpful. The progress is slow, however, because of the complexities of the problem (as we discussed before). We just have to hope for the best. Indeed and all the best for that coming to fruition in the near term. A theoretical computer scientist, Paul Snively, has crystalized the essence of my work in a logical sequence that I find quite interesting. A brief discussion of what he means by this sequence can be found on his blog: http://psnively.github.io/blog/2015/01/22/Fallacy/. After a few years of studying Bell's theorem, it (and its variants) seems to me that its interpretation(s) are one of the biggest hoaxes perpetrated on the physics community ever! All it really says is that a linear system can't violate the inequalities. Duh! Quantum theory never uses the theorem bounds to violate the inequalities. Take for example Bell-CHSH; simple examination shows the absolute bound to be 4 not 2 when each element is independent. For the Bell-CH inequality, the absolute bound used for QM to violate it is 1 not 0, etc. Agreed, Bell's theorem will be known as the greatest scandal in theoretical physics. It looks like some recent activities by the Bell mafia over at Pubpeer have backfired. I see some of their papers under serious attack, with one and possibly two of papers by a certain mathematical statistician completely discredited by peers over there, and two recent high-profile experiments proclaiming violation of inequalities discredited. From what I see, there is a lot of scrambling going on right now in the Bell camp. Interesting point about the CH inequality. I haven't looked at it carefully but I suspect I will find similar skeletons as we unveiled about the CHSH here a while back. I remember the mathematical statistician was advised not to publish the paper with the identified errors (viewtopic.php?f=6&t=30&start=10#p971) but he proceeded. I am writing to withdraw my membership of FQXi, effective immediately. If “resign” is the right word, then I am writing to resign from FQXi, effective immediately. I do not wish to be part of an institute which I consider to be too hypocritical and political for my liking. third-rate statistician like Richard Gill should not have been offered a membership of the institute. Please ensure that my name from the membership list on the FQXi website is removed as soon as possible. I don't hardly ever even go check out FQXi any more. They definitely dropped the ball on one of the biggest foundational questions for physics that there is. No sense being a member of an organization that suppresses the debate on really important foundational questions. minkwe wrote: Agreed, Bell's theorem will be known as the greatest scandal in theoretical physics. Yeah, it is quite an amazing phenomenon because of the extreme level of self-brainwashing by so many people that should really know better. Of course it is easy to see that for expected averages, each element will tend to 0.5 so it is true for that in a linear system. He pretends to be the authority on Nature herself, but sadly the above refutations of his arguments make it clear that he is not even capable of doing simple algebra. Nor does he mention that his own key paper has been comprehensively discredited on this forum as well as on PubPeer: viewtopic.php?f=6&t=30&p=3964#p3964 . “Dr. Bell used scalar algebra. Scalar algebra isn’t closed over 3D rotation. Algebras that aren’t closed have singularities. Non-closed algebras having singularities are isomorphic to partial functions. Partial functions yield logical inconsistency via the Curry-Howard Isomorphism. So you cannot use a non-closed algebra in a proof, which Dr. Bell unfortunately did. … This is a sufficient disproof of Bell’s theorem." "... you can't insist on using an algebra that doesn't model space correctly and then claim that your "proof" about space [such as non-locality] has meaning." What is more, not only Bell’s original 1964 "proof", but ALL of the proofs of ALL of the Bell-type theorems, including the proofs of their variants and generalizations such as Hardy’s theorem or GHZ theorem, use only scalar algebra. Therefore all such no-go “proofs” are logically inconsistent (i.e., they are pure nonsense). 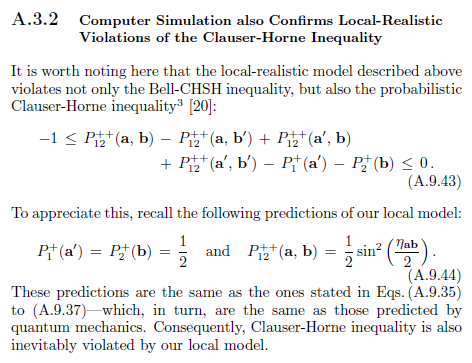 And some of you know that I have produced constructive disproofs of all such theorems, by means of explicit counterexamples, as in this paper and in my book. Sadly, the physics community has been misled by Bell and his followers for over half a century. And some of his ardent followers continue to mislead the physics community by stooping to extreme levels, as noted on this page of my blog. I personally have paid very heavy price for their misdemeanours. But more significantly they have done a far greater damage to physics itself. The worse part is that these zealots continue to do the damage by employing all sorts of dirty political tactics. That is an interesting website and I believe what you and he are saying about the higher algebra that is required to cope with spinors. You know that I agree with your formulae in the one page proof and have not seen anything that I disagree with in your other papers, though I have not followed all the more advanced formulae e.g. as in the S7 work. Quite a long time ago I agreed with you on the micro objects but was not accepting the same for the macro objects. However, I now agree with you also on the macros, but only by divorcing the macro from the micro. I.e. I can see that a spinning ball has rotation and hence should need the higher algebra to fully describe it. But I see that macro spinning hemisphere requires the spinor treatment only because of the above and not because of any dependency on it being made up of countless micro spinors. Despite now agreeing with you that a macro spinning ball needs the higher algebra, I am not clear how that higher algebra can be used on lab observations. I thought that the hidden variables can only be described using the higher algebra and that the (double cover) full information in the hidden variables is lost as soon as a lab observation (single cover) is made. So how can the single cover lab observations be used within the higher algebra? And if the lab observations are analysed using normal algebra, the full (double cover) information is immediately lost due to not using the spinor algebra? And in your macro experiment are not the lab observations to be analysed using normal algebra? In other words: how does the need for higher algebra to cope with rotations (which I agree with) fit with the proposed experiment using single cover lab observations analysed using normal algebra? Assuring you of my continued support. Thank you for your continued support. Paul Snively's website is indeed quite interesting. Ben6993 wrote: Quite a long time ago I agreed with you on the micro objects but was not accepting the same for the macro objects. However, I now agree with you also on the macros, but only by divorcing the macro from the micro. I.e. I can see that a spinning ball has rotation and hence should need the higher algebra to fully describe it. But I see that macro spinning hemisphere requires the spinor treatment only because of the above and not because of any dependency on it being made up of countless micro spinors. I wouldn't call it "divorcing the macro from the micro", but I understand what you mean. My reservation for the phrase "divorcing the macro from the micro" has to do with the quotation from Bell I have posted on the welcome (or main) page of my blog. In other words, it has to do with the fact that we are actually putting the macro and the micro on equal footing as far as the quantum (or strong) correlations are concerned. But this is a different conceptual point than the one you have in mind. Ben6993 wrote: Despite now agreeing with you that a macro spinning ball needs the higher algebra, I am not clear how that higher algebra can be used on lab observations. I thought that the hidden variables can only be described using the higher algebra and that the (double cover) full information in the hidden variables is lost as soon as a lab observation (single cover) is made. So how can the single cover lab observations be used within the higher algebra? And if the lab observations are analysed using normal algebra, the full (double cover) information is immediately lost due to not using the spinor algebra? And in your macro experiment are not the lab observations to be analysed using normal algebra? This is of course a very important question --- perhaps the most important question in the context of Bell's argument. It is also the question that drives, for example, Richard Gill's opposition to my proposed experiment (however, as you may appreciate, his manners and tactics of raising this important question is most disagreeable to me). To understand my answer to this question you would have to reflect on the equations (7) and (8) of this new preprint: http://arxiv.org/pdf/1501.03393.pdf . Notice the strict geometrical relationship between the scalar numbers and the bivectors . It is this strict geometrical relationship between the scalar numbers (single cover) and the bivectors (double cover) that drives the correlation calculated using the pure scalar numbers . I recommend studying the entire preprint I have linked above and see how far you understand what I am saying. If you get stuck at some point, then please ask me again and I will try to explain what is going on. But since you have read most of my papers you will probably follow my discussion in the preprint. Do you have a simple visualisation for the hidden variable of a macro spinning object? All I can think of is the normal spin +1 or -1, clockwise or anticlockwise along the linear direction of motion. For a micro object the hidden variable corresponds to a trivector ijk = +1 or -1. If an S3 box is tangentially the same as R3 in the limit as volume -> 0, is the R3 tangential space for the two different trivectors identical? I keep thinking they should somehow be different because they are at opposite ends of the Moibus strip in that analogy. I can believe that for the micro but the mind baulks a little for the macro version. I have been thinking more about my previous post in general terms. I may have been confounding all those simulations with real experiments in my thinking. In real experiments we can just forget about higher algebra. Nature uses the hidden variables but we can forget about them and just use the observables. If the QM real experiments do work to obtain -cos theta for the micro case, than I agree they should also work for macro case (though it would be nice to get the visualisation for macro mentioned above). A danger is that if both the QM and macro experiments work, and you will obviously get the kudos for the latter, it could be said [and no doubt will be by some] that neither case depends on your hidden variable formulae. In some ways, I think that the simulations are the best hope for the acceptance of your theory. It still puzzles me why there was no agreed resolution of the outcomes. However, I accept that the time may not be right to air those again but it may need to be done after the experiment is completed. If the macro experiment works, the shock of that result for the establishment should give a fresh impetus to getting agreement on the outcomes of the simulations. Well, Richard Gill has done it again. Not satisfied with being banned from this forum as well as from Wikipedia, he has now managed to get himself banned from Paul Snively's blog as well. He will now have to find some other means to attack me and my work. I am sure you guys will find another place to carry on the battle. Here is a picture of oriented volumes created with GAViewer. FrediFizzx wrote: I am sure you guys will find another place to carry on the battle. Fred - how are the two polygonized spheres (hyperspheres?) to be interpreted? It's clear there is a reversal of the presumably equal magnitude surface normals, left wrt to right sphere. Also a slight relative rotation between the two that may be purely an artifact. Beyond that have no idea what for instance the 4 red dots signify. Are they meant to be aids to meditate? I tried to open the GAviewer website and it failed at first, but later it worked. In the meantime I looked on google and saw some items on the google listing that had moving 3D images, even on the google listing page. So presumably moving 3D images is possible using that software. I am interested in making a moving image of an electron structure in my preon model. Three colour branes form a triple helix. The coloured preons are joined to the branes at one end of each preon (a string-like object), the other end being free. A red preon attached only to a red brane etc. The free end of a preon attracts a preon of another colour. It is like the double helix which has A/C/T/G instead of the coloured preons. But the triple helix is dynamic. The preons twist and that caused the 3-helix to 1) twist into the helix shape and 2) to keep on twisting. If the ends of the helix join, it could look (at least superficially like a Hopf fibration). Do you think that the GAviewer software can enable a dynamic image of the triple helix to be made? I note that while Jay seems to have eschewed the wooden ends of his recent structures (wrt fractional charges) I have the mysterious branes put in their place. The preons are attracted together by hypercolour, which is an essential extra force in my model. Footnote to my previous post. I noted that I think of the coloured branes as mysterous things which seem to take the place of Jay's wooden blocks which have been rejected from his fractional charge model/theory/or whatever, just leaving the strings. I have strings embedded in branes which are extra dimensions, and those dimensions need to be intertwined. My preons are strings which 'keep on twisting' making the electron a continually dynamic object. So the helix keeps on twisting just as Felix kept on walking. That also is different, I believe, from Jay's strings which spin because of their chiral twist when moving throug the vacuum (which is not null) - rather like a sycamore seed spiralling as it floats to earth. My best image of the preon is a chiral universe which keeps on expanding via dark energy. I don't see how the string could maintain approx speed c if there was no internal motor of some kind. I know that motion is maintained free of effort in vacuum by inertia, but if the twisting motion is acquired for free just by having a chiral structure ... that seems too much like something for nothing. Unless that spin is set off at t=0 and is maintained by inertia? The spheres are not polygonized nor hyperspheres. I just drew them in wireframe mode so one can see the internal lines for orientation on the right one. The four red dots are points that define the sphere. I could have done it without the red points but it was part of an exercise I was following in the tutorial. In geometric algebra, I just did I=e1^e2^e3 basically which produces the sphere on the left. The sphere on the right is equal to -I. This is part of Joy's basic physics postulate for his local realistic model. FrediFizzx wrote: The spheres are not polygonized nor hyperspheres. I just drew them in wireframe mode so one can see the internal lines for orientation on the right one. The four red dots are points that define the sphere. I could have done it without the red points but it was part of an exercise I was following in the tutorial. In geometric algebra, I just did I=e1^e2^e3 basically which produces the sphere on the left. The sphere on the right is equal to -I. This is part of Joy's basic physics postulate for his local realistic model. As you know, the sign of "I" is the "hidden variable" in the model. It specifies the orientation of the 3-sphere. So we need to distinguish the left oriented 3-sphere from the right oriented 3-sphere. Can you color the two "I"'s differently, for example red lines for "+I" and green lines for "-I"? It is difficult to set apart left orientation from the right orientation. At the moment your two pictures look more or less the same to me.